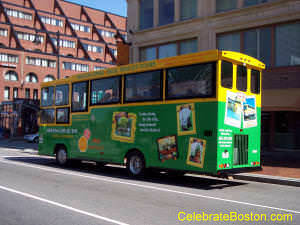 Upper Deck Trolley Tours is a popular tour operator in Boston. Their sightseeing busses are very conspicuous, with large bay windows and bright green paint, and can be seen all over downtown Boston. The distinguishing feature of Upper Deck trolleys are their ramped theater-style tiered seating arrangement. The colorful, climate controlled and comfortable trolley busses have been referred to as the "Green Fleet" due to their distinctive paint scheme. Upper Deck's narrated tour of Boston and Cambridge is 2-1/2 hours in duration, the longest of all motor tours in the city. The company offers unlimited boarding, which allows significant savings if one doesn't take the subway many times to get around. At the time of this writing, Upper Deck bundles a free 2nd day with each purchase, as well as a free boat ride (seasonal). Please refer to the official web site for any current special offers. The trolleys follow a route with 21 fixed stops (most have many nearby attractions): Long Wharf at New England Aquarium, Paul Revere House, Old North Church, USS Constitution, Bunker Monument, TD Garden, Old State House, Boston Common, State House, Beacon Hill at Otis House, Galleria Mall near the Museum of Science, if one takes the Cambridge loop bus transfer, Kendall Square, Harvard Square, Charles Street back in Boston, Public Garden, Christian Science Plaza, Fenway Park (no stopping on game days), Prudential Center, Trinity Church and Copley Place at Copley Square, South Station with a free shuttle available to JFK Library, Theater District, and lastly Commonwealth Pier in the Seaport District. Upper Deck also offers private charters for special occasions such as school field trips, convention or business meetings, weddings, birthday parties, or to other locations within New England. Customers can buy tickets online, or visit their main ticket booth locations at the Charlestown Navy Yard or at the Galleria Mall in Cambridge.